In the article Model Future (page 49) he introduces the concept of maintaining a “digital twin” of a real aircraft in order to simulate its performance throughout its lifespan. This article also seems to be based, in part, on the panel discussion held at AIAA Aviation 2014. In the article Quantum Shift (page 53) he delves into the futuristic topic of quantum computing as a means of meeting the computational requirements of CFD in 2030. Geometry, mesh, and CFD solution. Image from Aviation Week. DEVELOP3D shares a nice overview of Autodesk’s acquisition and inclusion of NEi’s NASTRAN. The CAD Insider is also thinking about Autodesk and NASTRAN. Issue 36 [Why not a month and year?] of CD-adapco’s Dynamics magazine is available online. The Leap CFD blog has a great story about the use of CFD to design James Cameron’s DeepSea Challenger which he rode to the bottom of the Marianas Trench (11 kilometers down). CFD simulation of DeepSea Challenger’s thrusters. 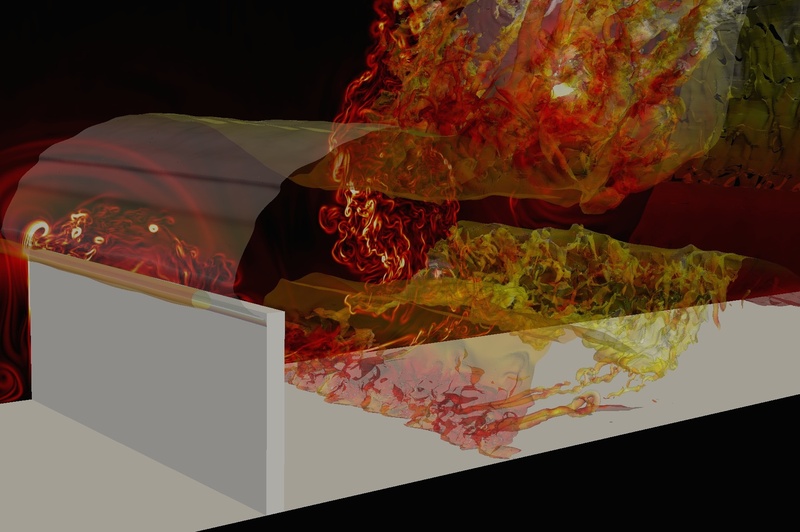 Image from the Leap CFD blog. See text for link to article. 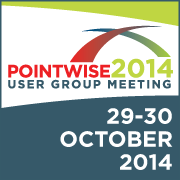 The agenda for ESI’s OpenFOAM User Conference 2014 is now online. Hotel rooms available at the special rate for the International Meshing Roundtable are rapidly disappearing. Register soon. There’s still time to register for the FLOW-3D Americas Users Conference. The Call for Papers closes on 12 September. The Meshy Award Deadline is 15 September. The special hotel room rate expires on 27 September. Is Autodesk Flow Design really the “easiest CFD program ever?” At $210/year it may be the least expensive (open source excepted, obviously). Symscape shares tips for getting rid of acute angles in your geometry and mesh. 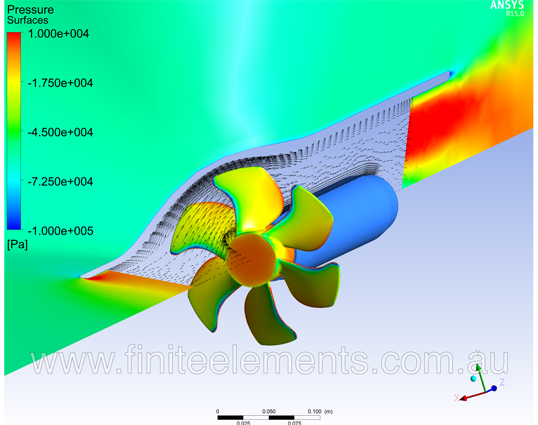 The CFD World blog has compiled a list of CFD codes for marine applications. Autodesk Meshmixer v2.5 is now available. When it comes to scripting languages, engineers seem to love Python. If you’re like me and don’t know it, here’s how you can learn beginning with An Intro to Python Scripting. Speaking of Python, here’s a nice overview of PyFR, a Python-based CFD framework. Flow simulation by PyFR over a 90 degree spoiler. Image from TechEnablement.com. Visualization is such a huge part of CFD. Let’s see if you can be a winner. You have a little more than a week to submit your entry for the Information is Beautiful 2014 Awards, sponsored by Kantar. Buried about a third of the way down in the SIGGRAPH 2014 review article in upFront.eZine is a tantalizing teaser about a potential solution to the fat-finger problem for tablet usage of CAD. The second edition of I do like CFD is available in both print and PDF formats. Wind tunnel and CFD study of the natural convection performance of a commercial multi-directional wind tower. 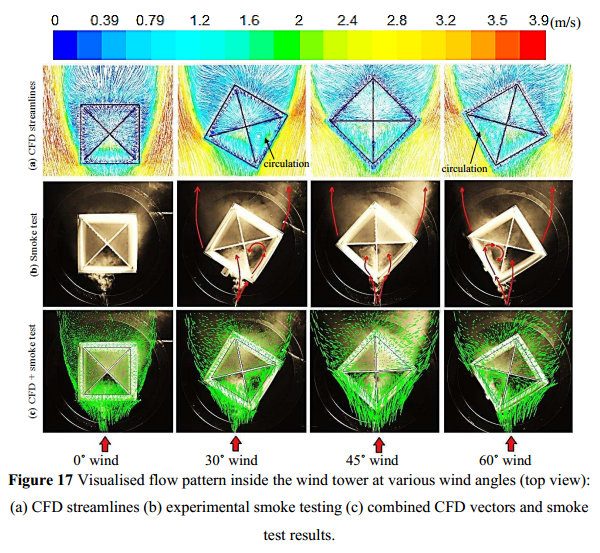 CFD and experimental results for a wind tower. From the article cited above. From Buffalo’s Albright-Knox Art Gallery [well worth a visit if you’re in the area] comes this 3D surface grid – otherwise known as Cycle by Sopheap Pich. He draws inspiration from his native Cambodia and his painful memories of the Khmer Rouge to create modern forms that reflect organic shapes. 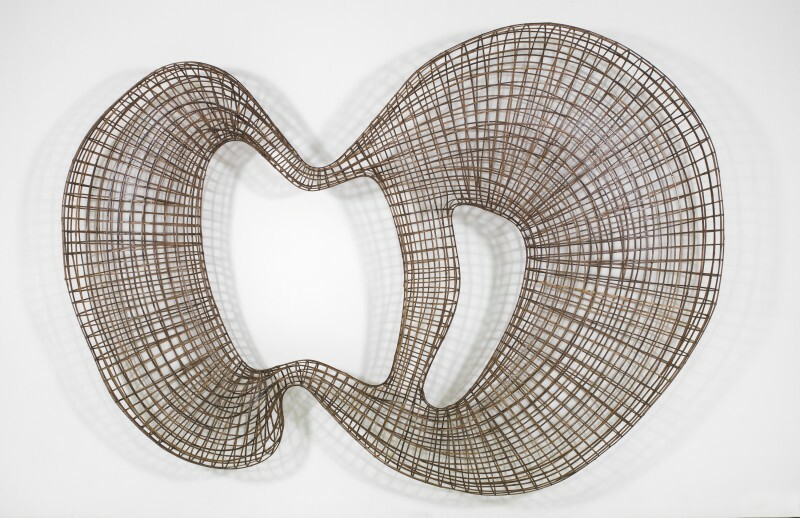 These shapes, simultaneously human and digital, are made from materials such as bamboo that are native to his homeland. This entry was posted in Applications, Events, Hardware, News, Software and tagged Autodesk, CD-adapco, ESI, FLOW-3D, International Meshing Roundtable, MeshMixer, Nastran, OpenFOAM, OpenVSP, Pointwise User Group Meeting, PyFR, Python, Symscape. Bookmark the permalink.